Clifford Law Offices is one of the nation’s premier aviation law firms, and our aviation accident practice group is among the most experienced in the world. We work tirelessly to help clients in the Chicagoland area, across the nation, and throughout the world determine aviation liability and pursue aviation cases of all kinds. We have successfully represented passengers and crew members involved in commercial aviation litigation as well as crashes involving private airplanes, small airplanes, corporate jets, and helicopters. We handle all types of aviation cases, not just those involving crashes. If you or a loved one has been injured in an aviation-related accident, such as being hurt by a plane propeller, suffering injuries while maintaining an aircraft, or being hurt at a public or private airport, please reach out to us immediately so that we can advise you about your options. The Answers You Need. The Justice You Deserve. Can surviving family members sue when their mother/father, son/daughter, or other relative dies in an aviation accident? Who is responsible for the crash? Can I sue the airline or aircraft owner? I survived an airplane or helicopter crash and am now disabled – what can I do? Does the country where the airline is based affect my case? We will protect your interests throughout all stages of your case, regardless of whether you are a survivor of an aviation accident or have lost a loved one in one of these tragedies. Whether we are gathering evidence or fighting for you at trial, we will seek justice for you and your family, and we will always put your best interests first. View our Aviation Timeline graphic and our Aviation Brochure to learn more. As you can imagine, building a case in an aviation accident is significantly more difficult than in a car crash or other ground-based accident. The severe damage suffered on impact can obscure evidence and make it harder to build a compelling case that shows the true cause of injuries or wrongful death. As such, your choice of aviation attorney is important. When you choose Clifford Law Offices, you choose a firm that has served as counsel in a significant percentage of the major aviation accidents that have occurred in the past 30 years. This means that we know how to properly position your case during settlement negotiation and at trial and how to seek an efficient, yet fair, resolution to your claim. Our lawyers resolve all aviation accident cases according to our clients’ goals and best interests. We have the skill to close insurance settlement negotiations for high dollar amounts, as well as to take a case to trial if we believe that will secure a better outcome. Our flexibility, tailored legal services, and commitment to clients sets us apart from the competition in Chicago. In our firm’s years of personal injury and wrongful death litigation experience, we have collected more than $2 billion in settlements and judgment awards for clients. We have been involved in almost every aviation accident case in the United States in the last 30 years. Our hard work has led to as much as a $110 million award in a single airline crash case. Though money can’t bring back your loved ones after the tragedy of an airplane crash, it can ensure negligent parties are accountable and that victims or their loved ones receive compensation for pain and suffering, years of lost wages, and medical or funeral expenses. We routinely secure six- and seven-figure awards for clients involved in aviation accidents in Illinois and around the world. In 2016, there were more than 1,300 aviation accidents in the United States. 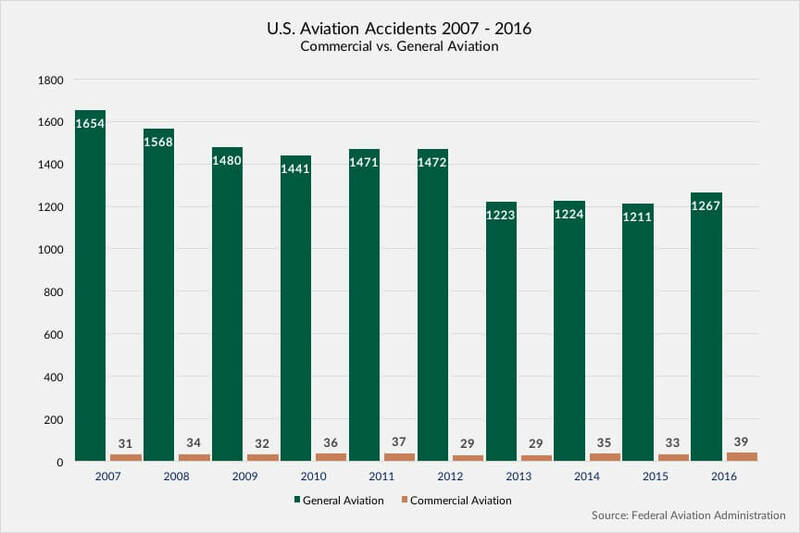 Nearly all of the crashes were in general aviation (1,267) rather than commercial aviation (39). However, regardless of the type of flight or aircraft involved in the crash, we can help. Our attorneys will work with investigators, the authorities, and other parties to identify the cause of the aviation accident, determine negligence, and prove fault. With our help, you can demonstrate to an insurance company, judge, and/or jury that someone else’s negligence caused your personal injuries or the premature death of a loved one. Human/pilot error. Humans can cause aviation accidents through mistakes such as failure to follow proper take-off/landing procedures, premature descent, excessive landing speed, missed runways, failure to refuel, navigation mistakes, and making dangerous miscalculations. malfunction arose due to negligent maintenance. Bad weather. Sometimes, what the law refers to as Acts of God cause aviation accidents. While no one can be accountable for causing bad weather, a pilot or aviation company could be liable for negligently failing to check the weather, underestimating the dangers, or failing to obey proper procedures in a storm or fog if these mistakes caused the injury. Other common causes include sabotage (e.g., terrorist activity), ground crew error, passenger negligence or intent to harm, improper cargo loading, runway obstructions, and in-flight fires. Regardless of what caused the aviation accident, such tragedies should never happen. Call Clifford Law Offices after suffering injury or the death of a loved one in such an incident. Leave your case in our hands as we launch an investigation, gather any available evidence of negligence, and build a personal injury or wrongful death claim. Medical costs. Medical care for yourself or a loved one who died, including any future medical care for long-term or permanent injury, should be a part of an aviation accident settlement or award. Lost wages. If you missed work while recovering from your aviation accident, list your lost income as part of the compensation. If the accident cause a permanent disability, this may include the loss of future earning potential. Pain and suffering. The civil justice system enables you to seek damages for physical pain and suffering, emotional toll, mental anguish, and other intangible impacts from an aviation accident. Wrongful death damages. If you lost a loved one in a plane crash or other aviation disaster, surviving family members may be eligible for damages such as loss of consortium, funeral/burial expenses, and lost inheritance. After an accident involving an aircraft, discuss the case with an attorney. For more details about compensation or to understand the elements of a wrongful death claim in Illinois, contact our lawyers and request information. Each case is unique, but we promise to do our best to obtain the best possible results for every client. Aviation accident claims can involve complex laws and regulations that may make it more difficult for victims to receive compensation. The Montreal Convention, for example, introduced a two-tier liability system that is helpful for accident victims. After the passing of the Convention in 1999, aviation accident victims involved in international flights no longer must prove willful neglect of the air carrier to obtain compensation. Instead, carriers are strictly liable for damages up to $100,000. The goal of the rule was to reduce the timeline of litigation for victims. Aside from air carriers, other parties may also be at fault for aviation incidents. Liability could rest with the owner of the aircraft, its pilot/operator, other common carriers, and/or equipment manufacturers. Many cases involve multiple parties sharing fault, such as the air carrier and a manufacturing company. Shared fault could result in higher compensation for you. Discuss your incident with a lawyer for more insight into your case. Clifford Law Offices is both a compassionate law firm and one experienced in aviation accident claims. We are a trusted resource for aviation law. Our lawyers have garnered some of the most impressive case results for aviation accident victims on record in the United States. Our experience means we know how to litigate claims to the best interests of our clients in crashes involving airplanes. For more information, see our aviation case results. Attorneys Robert A. Clifford, Kevin P. Durkin, and Richard F. Burke Jr. have obtained results ranging from $450,000 to $110 million in previous aviation accident lawsuits. We have handled cases involving a range of causes, from blatant pilot errors to intricate mechanical failures. Regardless of the aviation’s explanation of events, speak with our lawyers to learn whether negligence was a factor. We are here to protect you, not an airline or insurance company. We will give you a free and straightforward review of your case in Chicago. Obtaining the financial recovery that you and your family need to move forward after a devastating aviation accident starts with a phone call to Clifford Law Offices. Your initial consultation is free; in fact, you only pay if you receive compensation. Call (312) 899-9090 to discuss your aviation accident in more detail with one of our lawyers.